I recently visited a home on Marvin Avenue off of West 25th Street that was built in 1895 by German immigrants, known as the Hattler House. The current occupants, Bud and Robert, purchased the home in 2000 and are working hard each year to restore it, as well as make it their own. They extensively researched the history of the home and offered to share the information they gathered with me, and I would like to share it with you. The property sits on what was once a 57-acre site in Brooklyn Township. In approximately 1887, brothers Oscar and Alfred Herold (of the Herold Bros. Barber supply company) subdivided Tract A of the property into nine lots. Alfred built this home in 1895 and lived there with his family until they built a home on Lake Avenue. Their son Armin lived in the home until 1914, at which time it was sold to the Hattler family. Simon Hattler was a German immigrant who purchased the home with his wife Genevieve. 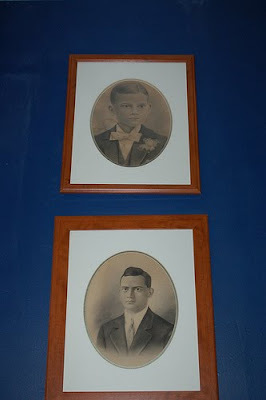 Simon owned a tailor shop on Lorain Avenue, and he and his wife had five children together named John Paul, Martin L., [both brothers pictured] Wilhelmina (Minnie), Mathew (Mat) F., and Rose. Mathew was the only child to marry and he and his wife Rose moved to East 43rd Street. The rest of the family remained in the home on Marvin Avenue until their deaths. 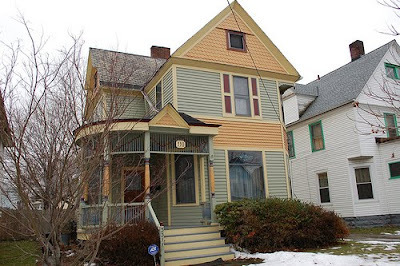 In fact, this home was in the Hattler family for 65 years, which is why it is known today as the Hattler House. The home has many beautiful features that attracted the current owners to purchase it, first of which is the intricately detailed wood flooring. These floors had been covered in soot because Rose, the final Hattler family member to live in the home, had been burning trash to keep warm after the furnace stopped working. 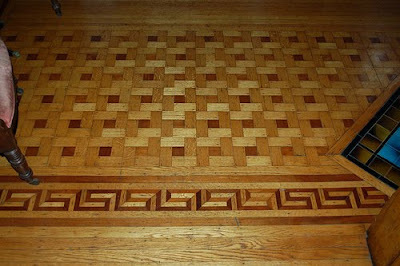 The next owner, Benny Bonanno, uncovered these floors as he was preparing to lay down carpet. 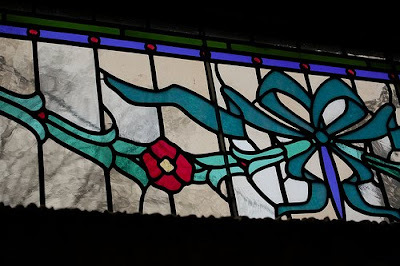 There were several stained glass windows decorating the home, however, they were stolen in the 1980's, recovered, and then sold at a yard sale by a later owner! 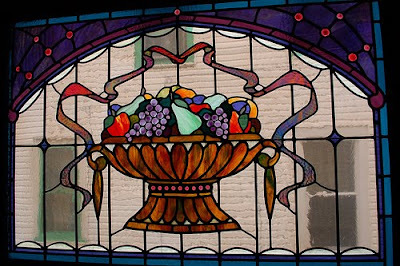 Both the fruit bowl window and the blue ribbon window in the front room were recreated to try to match the originals, using old photographs of the home. 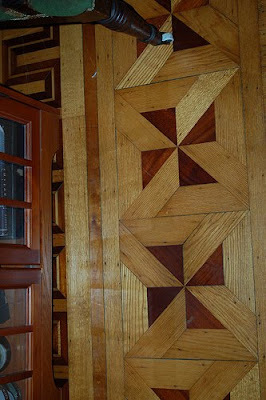 Robert and Bud could tell that there once had been a spandrel between the entry and dining room, so they had this piece created to fit the space. 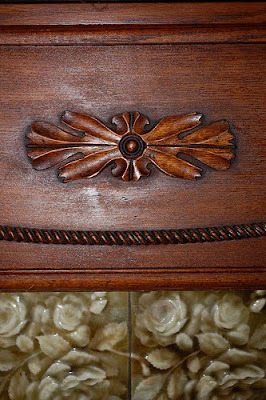 On the first floor there are two fireplaces; the one in the entry had been replaced at some point, however the fireplace in the dining is original (although missing its original mirror and shelves) and features a fantastic wood detailing as well as delicate floral tile work. I noticed several other hidden gems both on Marvin Avenue and in the surrounding area as I drove around after my visit. Cleveland is lucky to have residents such as Bud and Robert who take great care to preserve their historic homes that are treasures from our past. I hope that someday I can uncover a hidden gem and restore it to its original beauty as well. Labels: 1890s, architecture, Brooklyn, Cleveland, German, Hattler, Herold Bros. 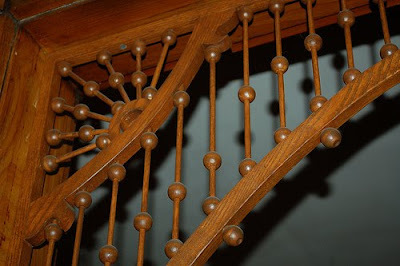 Theft of historic house fixtures is, from what I hear, a huge problem in Ohio City and environs. I often wonder what happened to my own original doors, built-in cabinets, and fireplace. 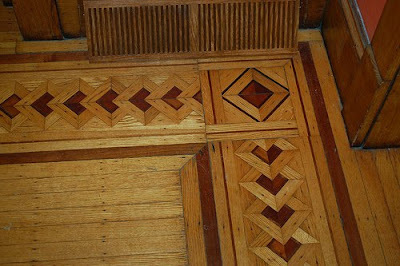 If only I'd uncovered floors like that! Robert and Bud's house is beautiful and they've put a lot of effort and resources into restoring it. It truly is a jewel. And as an FYI, the person who recreated their stained glass windows also did two windows for me and she's an amazing artist. Her name is Kate Dupuis of Rainey Dupuis Studios in Cleveland. She also restores windows. I often wonder where all these stolen house parts go. They certainly don't seem to be coming on the market around here. Benny Bonanno gets around ... he used to live in the house next to us and still owns it. I have to say that before we had the windows made, I hit multiple antique stores around town and there are still a lot of windows out there for sale. I think, though, that many are picked up and sold in other markets (like on the coasts) where they can fetch a higher price. Your house is awesome! Nice work restoring the place. I love it when residents restore instead of gutting the whole thing. What a treaure for Cleveland's neighborhood. Amazing! My grandfather was Armin Herold from Cleveland, I'm sure this must have been his home. I had no idea where he might have been brought up. I do know he later moved to Belle Avenue, where my father was raised. My father (now 94 years old) will be fascinated by this! Roy, are there any family snapshots that include this house? We'd love to see them.